Avast ye landlubbers! Click here to play! Is it treasure you be seeking? Ha! I'd like to see you try to find the old Captain's Treasure. Captain Blingbeard had an eyepatch made of gold for an eye made of gold and had his gold teeth filled with gold filling, so they say. If ye can find his treasure, you'd be rich for life, I grant ye. Can I tell you how to find the treasure? Now, why would I do that? Well, I suppose it ain't as if it'll do ye much good. Your best bet is to look for a place marked with cutlasses or pictures of old Blingbeard. Find five strong cutlasses, and you'll know you're close to the Captain's Treasure. If they're surrounded with treasure chests, you're in even more luck. You could easily get everything you put into the venture and more if you manage to find Blingbeard's cutlasses and treasure chests! Blingbeard had a lot of treasure, though, and he's left many markers. Anytime you see a group of steering wheels, anchors, maps or poker cards all lined up as if like an arrow to your spoils, dig in that spot to find a pile of booty the likes of which you will not see again. Bah! I still don't think you'll discover the Captain's Treasure, but prove me wrong! Treasure chest symbols on consecutive reels win players an amount times the total bet, depending on how many treasure chests appear. 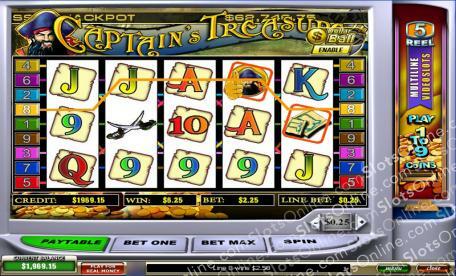 The pirate captain symbol is wild and doubles the win on its payline, non-cumulatively. It may substitute for anything, including a scatter symbol.